As with any crisis, early information is incomplete and sometimes outright wrong. The day after the Boston Marathon bombings, a clearer picture has emerged. Let's get up to speed with where things stand right now. What do we know about the bombs? The first bomb went off at 2:50 p.m., a few feet short of the finish line, in front of a sporting goods store and a LensCrafters. The second went off 12 seconds later, about a block further up Boylston Street, which serves as the home stretch of the marathon. 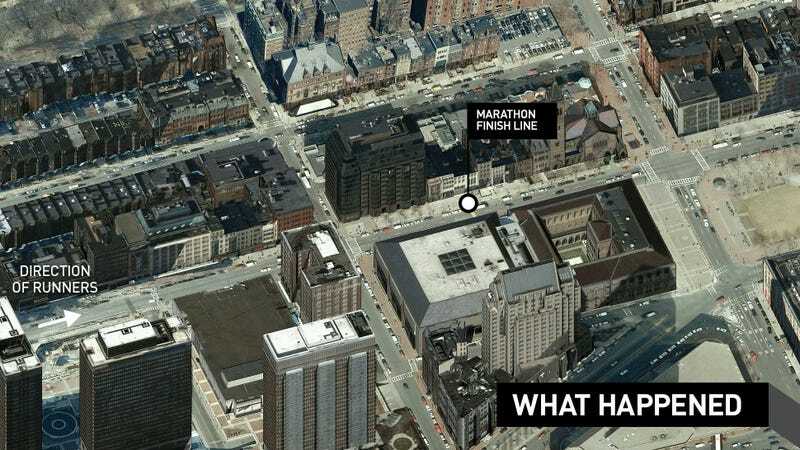 You can see the blast locations on the map above, annotated with eyewitness video of each explosion. The bombs themselves were "small portable explosive devices." A surgeon at one Boston hospital likened the injuries treated to those caused by "improvised explosive devices." Initial reports claimed the bombs were set off inside trash cans, but authorities seem to have backed off those claims. At the very least, the inward-shattering storefront windows indicate the explosives went off on the sidewalk, as opposed to inside the stores. An Associated Press report now says the bombs were were "fashioned out of pressure cookers and packed with shards of metal, nails and ball bearings," placed in duffel bags, and left on the ground. Contrary to early reports, there were no other explosive devices found in Boston, Gov. Deval Patrick confirmed at his press conference this morning. There were hundreds of packages left behind by fleeing spectators, and all had to be inspected, which was the source of a lot of confusion yesterday—particularly for those people following along on a police scanner. But now officials are adamant: The only explosive devices along the marathon route were the two that detonated. The library, several miles away from the marathon route, was the scene of an intense-looking fire soon after the bombs went off, and people naturally jumped to conclusions. But it was soon determined that it was accidental and unrelated and had started in the building's HVAC system. How many people were hurt? After spending most of the afternoon at two, the death toll rose to three last night. One of the dead has been identified as 8-year-old Martin Richard from Dorchester, Mass., who was near the finish line with his family. They were moving away from the first blast when the second one hit. Richard's mother (head) and sister (leg) reportedly suffered "grievous" injuries in the blast, while his brother was unhurt. A second victim has been identified, 29-year-old Krystle Campbell, of Arlington, Mass. Campbell was at the finish line to cheer on her boyfriend, who was running the race. "These runners just finished and they don't have legs now," said Roupen Bastajian, 35, a Rhode Island state trooper and former Marine. "So many of them. There are so many people without legs. It's all blood." No. There is, however, a "person of interest," to use the authorities' term. For most of yesterday, the New York Post had claimed a Saudi national injured in the blast was under guard at a hospital and being questioned. The report was largely ignored, along with the Post's death toll of 12 (which the newspaper has quietly stopped citing today), but there's more confirmation now. Despite conflicting reports, a 20-something student from Saudi Arabia, in Boston studying English, has been questioned at Brigham and Women's Hospital, where he's being treated for shrapnel injuries. Last night federal and local authorities searched his apartment in Revere. Everything We Don&apos;t Know About Boston&apos;s "Person Of Interest"
The FBI has taken the lead in the investigation, and the bureau is seeking information and especially video from anyone near the finish line. You can contact the FBI at 1-800-CALL-FBI (1-800-225-5324). The Red Cross received more than enough blood donations to cover present needs, as always seems to be the case after a tragedy. But blood doesn't keep, and there are plenty of people around the country who will need blood in the coming weeks and months. The Red Cross encourages you to make an appointment by calling 1-800-RED CROSS or visiting redcrossblood.org. How hard is it to get around/out of Boston today? Things are moving relatively smoothly. Logan has no major delays, though you should expect extra security at airports and train stations. The MBTA is running close to normal, with the Green Line stop at Copley closed until further notice. Last night's Senators-Bruins game was postponed, with the new date yet to be announced. Tonight's Pacers-Celtics game has been canceled, and will not be made up. The first Boston-area sporting event will be the Sabres-Bruins game on Wednesday night. It'll be emotional. I ran the marathon. Now where's my stuff? The Boston Athletic Association has changed the location where runners can pick up their bags. They're now at Berkeley Street, between St. James and Boylston. Did you see that guy on the roof? Yeah, we saw Roof Guy. The presence of Roof Guy would only be suspicious if watching marathons from rooftops wasn't an ultra-common thing to do, or if police surveillance didn't regularly keep watch from rooftop posts. But no, you're probably right. That guy's up to no good. Way to crack this case wide open. 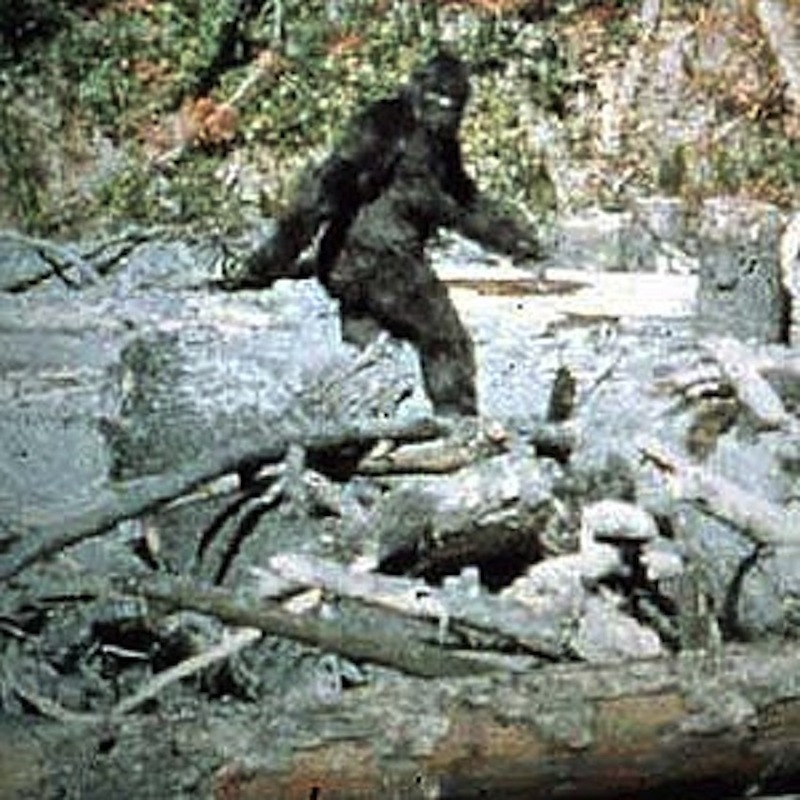 Maybe it's Bigfoot? Maybe it's Obama? You bet. Within a half-hour of the blasts, conspiracy-monger Alex Jones declared that the government had staged the attack. Last night, someone from Infowars asked the governor if this was "another false flag attack staged to take our civil liberties?" This morning he was asked about Roof Guy. The timing gave rise to other kinds of speculation: Monday was Patriots' Day, after all. It's a Massachusetts holiday commemorating the opening battles of the American Revolution, one that's been co-opted by fringe groups. The Waco assault occurred on Patriots' Day, though a different date (April 19). The Oklahoma City bombing occurred on the anniversary of Waco, though not on Patriots' Day. Other anniversaries this week: the Columbine shooting, the Virginia Tech massacre, and Hitler's birthday. Gawker has a full rundown of conspiracy theories. Aerial photo via Bing Maps. Graphic by Jim Cooke.